The NFL has suspended Dallas Cowboys running back Ezekiel Elliott six games for violating the league’s personal conduct policy. The suspension follows an investigation into domestic violence allegations made by Elliott’s ex-girlfriend. Elliott plans to appeal the suspension. Thompson also claims there was an incident of domestic violence that took place in Florida in February 2016. There are also allegations made against Elliott of misconduct during the St. Patrick’s Day parade in Dallas earlier this year. There were also reports of Elliott punching a DJ at a Dallas nightclub in July. However, the investigation was called off when Dallas police couldn’t locate the victim. Even with no formal charges against Elliott, the NFL has conducted its own investigation into the Cowboys running back. Over the course of the investigation, the NFL says it has interviewed witnesses, including Thompson, consulted with medical experts, and examined evidence such as photographs and text messages. Todd Jones, the NFL’s special counsel for conduct, wrote a letter to Elliott, informing him of the league’s decision to suspend him following the investigation. “There is substantial and persuasive evidence supporting a finding that you engaged in physical violence against Ms. Thompson on multiple occasions during the week of July 16, 2016,” Jones wrote to Elliott in the letter. Initial reports indicate that Cowboys owner and GM Jerry Jones is unhappy with the NFL’s decision. Jones addressed the issue when the Cowboys began training camp. He said he reviewed the evidence and concluded there was “absolutely nothing” connecting Elliott to domestic violence. Amidst the nearly year-long investigation, Elliott had a sensational rookie season with the Cowboys. He rushed for over 1,600 yards and 15 touchdowns, helping Dallas reach the playoffs. He won Offensive Rookie of the Year honors, was selected to the Pro Bowl, and named to the first-team All-Pro team. Elliott now has three business days to file an appeal. Assuming he does, an appeal hearing will be scheduled within 10 days. That means he will likely receive a response to the appeal before the start of the regular season. Elliott’s appeal will likely be heard by either NFL Commissioner Roger Goodell or former NFL executive Harold Henderson. 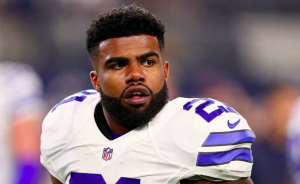 Assuming the 6-game suspension is upheld, Elliott will lose roughly $240,000 per game. He will also have to repay a portion of his $16.350 million signing bonus. Meanwhile, the Cowboys will have to prepare as if they won’t have Elliott for the first six games of the season. Darren McFadden would likely step into the starting running back role. McFadden only appeared in three games for the Cowboys late in the year after being sidelined with an injury to start the season. However, McFadden did rush for over 1,000 yards with the Cowboys in 2015. Alfred Morris and Rod Smith and also on the depth chart behind Elliott and McFadden. Even with a nice contingent of backups, the Cowboys have to be concerned about losing Elliott for six games. He was an impactful player last season and a huge part of the team’s success. Starting the season with him suspended for six games could make a huge difference in a competitive NFC East.